The British Motor Museum's National Metro & Mini Show is delighted to announce its 2019 plans to celebrate the iconic Mini's 60th Anniversary. The show will move from its normal June slot to Sunday 4 August 2019 in what promises to be an action packed show for all Mini & Metro enthusiasts. The show will be supported by various Mini clubs including the 59 Resister, the Mini Traveller and Countryman Register and the Cooper Sport 500 Register. Plans are also coming together for a Guinness Book of Records attempt on the Saturday before the show to create the longest line of Mini's ever seen. Tom Caren, Show Manager at the British Motor Museum said "As home to both the first and last classic Mini's, it is only fitting for the British Motor Museum to celebrate the Mini's 60th anniversary. 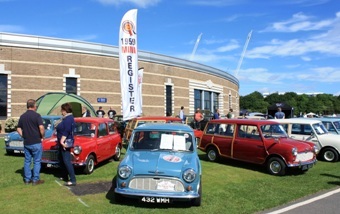 The 2019 National Metro & Mini Show will be held on 4 August, the weekend before the International Mini Meet to allow our international visitors and Mini enthusiasts to plan for a week of Mini 60th celebrations." Visitors to the Show will also be able to explore the Museum's collection of over 300 historic British vehicles dating from the 1900's to the present day and camping will be available for the weekend.